Authorities accused of aggravation against political rivals. Law enforcers have arrested Mayor Yevgeny Urlashov of Yaroslavl and three of his subordinates on charges of bribery. The mayor denies any wrongdoing and claims his arrest was politically motivated. Urlashov is a member of an opposition party, the Civil Platform, which is set to challenge the ruling United Russia party in fall elections. The Interior Ministry claims that 14 million was only the first portion out of a total of 45 million rubles ($1.3 million) solicited. A source from the social network publication Gazeta.ru and close to the law enforcement agencies said other charges might be brought against Urlashov. Another source close to the Presidential Executive Office adds that Urlashov’s independent political position has recently caused much trouble for United Russia. Urlashov was elected mayor a little over a year ago, after he defeated the United Russia candidate by a wide margin, winning more than 70 percent of the votes. Urlashov was formerly a member of United Russia, but he resigned from the party in 2011. He is now a member of the federal civil committee of Mikhail Prokhorov’s Civil Platform. “The demonstrative arrest of a popularly elected mayor is a blow against the civil rights and freedoms of every Russian citizen. Whatever the authorities may suspect Urlashov of, he is not a terrorist and is not on the federal wanted list,” reads the statement made by Civil Platform leader Mikhail Prokhorov and released by the party’s press service on Wednesday, July 3. Anatoly Greshnevikov, a State Duma deputy representing the Just Russia party, told Gazeta.ru that the mayor was arrested shortly after a rally against the governing party in Yaroslavl that gathered thousands of protesters. The Russian Internal Affairs Ministry believes the case against Urlashov should be treated as a political one. “I urge a more attentive listening to Yevgeny Urlashov’s conversations that have already been published in the press, in which he explains why he needs the money. It is clear from the context that it was certainly not for improving the city infrastructure,” a spokesperson for the Investigative Committee, Vladimir Markin, told journalists. “Although this is not, of course, in the interests of the investigation, some of the evidence has already been presented and some more will be presented soon,” said Markin. 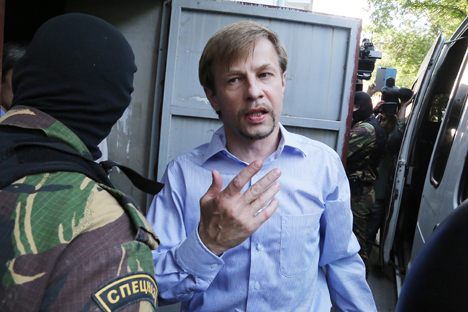 Experts believe, however, that Urlashov’s arrest will not benefit the governing party. “This affair will benefit rather the CPRF [Communist Party of Russia] and Just Russia. As for the future performance of The Civil Platform, much will depend on whether Prokhorov heads up the list and the campaign and takes a firm stand,” said Konstantin Kalachev, head of a political expert group. He thinks Urlashov’s arrest will be a test of political resolve for The Civil Platform. First published in Russia in Gazeta.ru.